Tired of Dealing with Dentist. Can I Get Dentures Instead? It seems like every single time I go for a checkup and cleaning my dentist finds several things wrong. Then, I spend the next few months fixing them. All my money goes to my dentist. Can I just extract them and get dentures so I can use my money on things I want? I understand your frustration. However, I’m going to warn you that this decision, if you follow through with it, can ruin your life. Here is why. It sounds like you’re still pretty young. Unless you’re in your eighties, I wouldn’t recommend dentures. Instead, I’d recommend dental implants to prevent you from losing your jawbone. When your teeth are removed, your body reabsorbs the minerals in your jawbone to distribute elsewhere throughout your body, where it deems it more needed. This slowly shrinks your jawbone. After about ten years or so, you no longer have enough jawbone left to retain a denture. This is known as facial collapse. So, unless you plan on going on a liquid diet in about ten years for the remainder of your life in about ten years, you need a better plan. 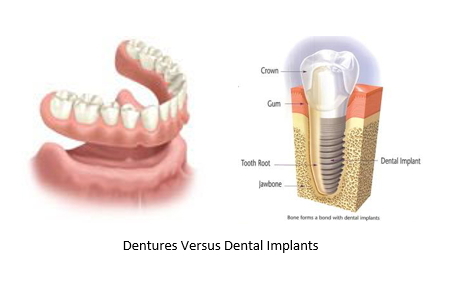 If you’re determined to remove your teeth, the ideal solution is a to get dental implants. You can see one in the illustration above. This is a surgical procedure which puts prosthetic tooth roots in your jawbone, using either titanium or zirconia. Then, after a healing time, you can have dental crowns put on top, or in your case, you’d have a set of dentures anchored to them. This protects you from facial collapse. It also avoids all the other problems that come with dentures. However, dental implants, especially the amount you need, is going to cost you way more money then if you just really bore down and had your teeth fixed. Another alternative is to get snap-on dentures. These just use two implants and your dentures snap on to them. They’re not as stable as implant overdentures, but it will keep them in your mouth. Truthfully, though I’m sure this isn’t what you want to hear, your best solution is finding out why your teeth are struggling so much. Go over your oral hygiene routine with your dentist to see if you’re missing any important steps. Also, until your teeth are back up to snuff, you can request to have a prescription fluoride to take home and use in order to give them some extra protection. If you can get your decay under control, you’ll save a lot more money and have a much higher quality of life than if you simply extracted and replaced your troublesome teeth.